Outdoor Fountain, Frog On Mushroom Led Lighting Decorative Indoor Fountain | Fountain City Art Ctr. Super Savings Item! 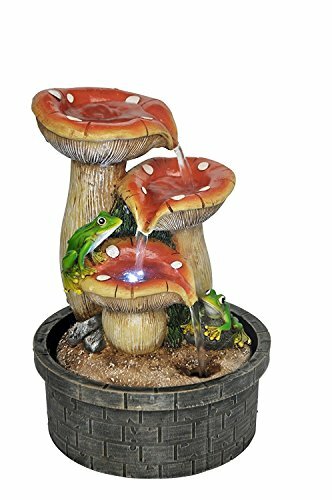 Save 38% on the Outdoor Fountain, Frog On Mushroom Led Lighting Decorative Indoor Fountain by SOUTHERN CAL CLOSEOUTS at Fountain City Art Ctr.. MPN: 48-73F2-5DB3. Hurry! Limited time offer. Offer valid only while supplies last. This waterfall fountain is made with high quality and durable polyresin. hand made and painted. Decorative fountain is great as decor for indoor and outdoor. Table fountain is a stylish piece of home decor that fits on the table; it adds beautiful value to any space. Frog on mushroom fountain comes with pump and led lighting. perfect as gift to your friends. If you have any questions about this product by SOUTHERN CAL CLOSEOUTS, contact us by completing and submitting the form below. If you are looking for a specif part number, please include it with your message.